All 127 pastors who completed the VM training program pose for a group shot in Vosloorus, South Africa, showing off their certificates before putting them to use. 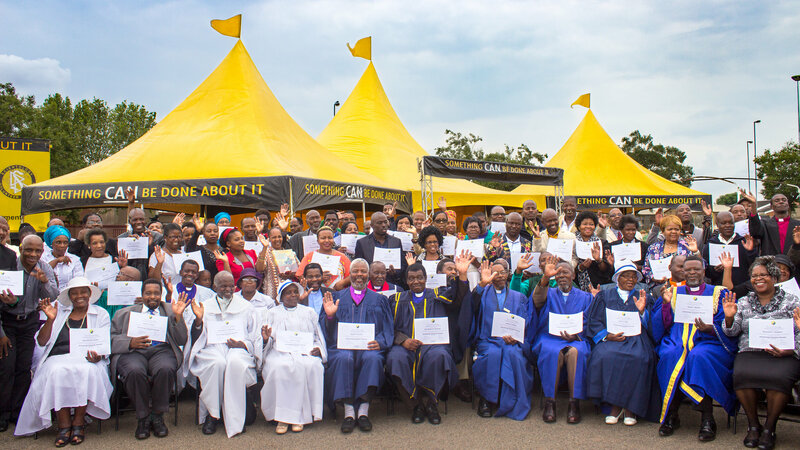 Following an extensive training program covering each of the 19 Volunteer Minister courses, 127 pastors on the outskirts of Johannesburg celebrate their newfound knowledge in a moving graduation ceremony. My people perish for the lack of knowledge,”—the oft-quoted phrase from the biblical Book of Hosea—was a sentiment shared by 127 South African pastors until their recent training series on the 19 chapters from The Scientology Handbook. In a lively, emotional graduation, between Zulu songs of praise and before a crowd of more than 400, each of the 127 religious leaders received his own certificate, attesting to his newfound expertise in a diverse range of subjects, from answers to drugs to study tools. “We can heal our nation,” declared one newly-certified pastor. Petrus Zwelibanze Dhlame, President of the Religion of Christ Church, Archbishop Azarias G. Ndlela of the Isiziba Church of God and Archbishop Jabulani Henry Ndaba received special appointments as Volunteer Minister Directors in their respective communities, where they will, in turn, train others in Volunteer Minister tools for life. While VMs continue to respond to every major disaster the world over, we take a look at the need that fuels that work. was caused by Hurricane Katrina in 2005, in the most costly natural disaster in US history. occurred between 2004 and 2013.
were reported from disasters over the same nine-year period. struck last year, leaving 98.6 million affected and $66.5 billion worth of damage. magnitude 6.0 and above have taken place since 2000 alone.